Every third Saturday of the month I intend to re-post something I wrote for one of my assorted old blogs or tumblogs. Today I am sharing “Symbol Confusion” from The Thinking Grounds, in which I consider the way certain common symbols don’t work for me. Churchill has famously called depression a black dog. The black dog visited when Churchill’s depression became active. But I like dogs quite a lot, including black ones. If a literal black dog were to visit me, it would make my periods of depression far more tolerable. Sometimes, if I need to distract or comfort myself, such as when I am getting a painful medical procedure, I imagine there is a large black dog lying next to me. Sometimes, if I feel like depression might come upon me in the near or near-ish future, I think of it as a fogbank approaching from the horizon. The image has the merits of specificity, and I feel like it would communicate to other people what I am feeling. However, I like fogbanks rather a lot, so the image feels inauthentic to me. This morning at church we had a baptism, and during the service the deacon lit a candle and passed it to the baby’s mother, saying, “Receive the light of Christ, to show that you have passed from darkness to light.” But I don’t like the light so much, or anyway I prefer periods of gloaming and overcast, light mixed with darkness. To save electricity I will sometimes move about the house without turning on any lights, and I do not mind this darkness. Apparently I did this often enough that a housemate once called me a vampire. Darkness, I find, can be a balm. Heaven is often depicted as being celestial, in the sky; Hell is subterranean, in the ground with the graves. The rich are the upper class, and the poor are the lower class. Revelations are sought and received on mountaintops. Thrones are placed on a dais, above the crowd. In pyramid schemes, those at the top benefit from those at the bottom. I, however, dislike heights. As with Antaeus, I feel stronger on the earth. Do not misunderstand: when I affiliate with the low, the shadowed, the misty, the marshy, the canine, I do not mean to paint myself as a friend to victims and outcasts and wretched sinners, as much as that sort of thing appeals to me. 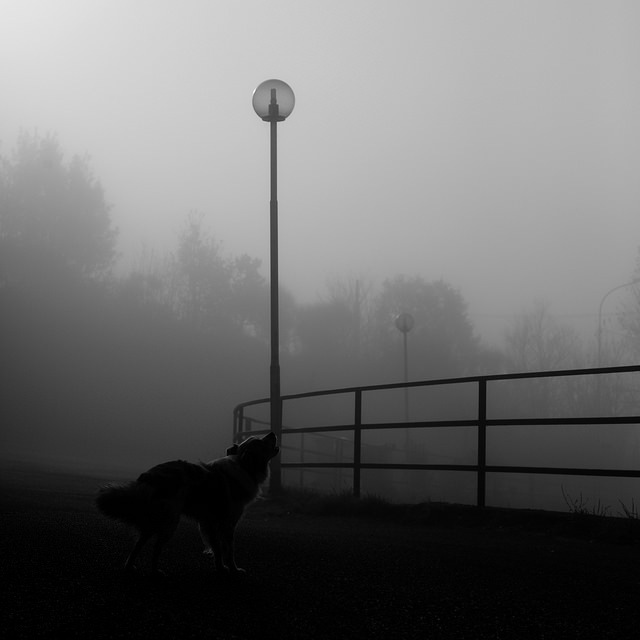 Rather, I’m just affiliating with the low, the shadowed, the misty, the marshy, and the canine, with no regard for their uses as symbols. More, I am not sure why they symbolize what they are used to symbolize: truth cannot be a light if it is so often unseen; power cannot be high in the air if it is so often entrenched. Some of these are said to be universal metaphors, which show up in every culture (that the anthropologists who made this argument studied): height always indicates status, size always indicates superiority, and so forth. It may be true that all cultures run on such symbols, but I doubt all people do. I sometimes do not. I wonder how important a skill it is to be able to confuse symbols, to break the equivalences of the symbol set you’ve inherited.